Tickets are now available online for the December Holiday Concert! Call Miller Auditorium for tickets at 269-387-2300. Congratulations to this year’s winner of our Youth Soloist Competition Michael Keeler from Portage Central High School. Thank you to all who auditioned. Come hear Michael Keeler perform his solo with the KCB at the April 13 concert. We are also inviting the other student soloists who participated to join us for a couple of numbers at the same show! The Kalamazoo Concert Band, an adult ensemble, was founded in 1961. The band’s membership is comprised of over 100 adults from the southwestern Michigan area. Over 25 of these members are current or retired music educators and teachers while the rest represent a diversity of occupations. Membership in the KCB is by audition and the band rehearses weekly, performing four free concerts each season. SUPPORT THE KALAMAZOO CONCERT BAND! Come explore and experience all that the KCB has to offer. All concerts are free and open to the community. Your support provides for renowned guest artists, a variety of music offerings, youth solo scholarships, and first class venues. Special benefits for our annual holiday concert. A scholarship competition for outstanding high school wind and percussion instrumentalists. The winner receives a $1,000 scholarship and the opportunity to perform with the KCB at its annual Spring Concert. 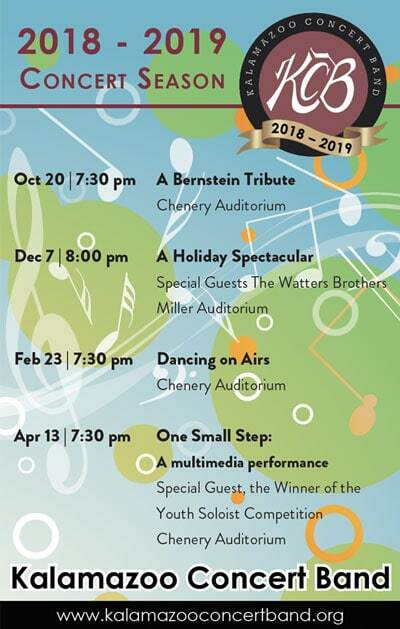 A legitimate artistic expression of symphonic band music for the greater Kalamazoo community as well as providing competent area musicians an opportunity to continue their instrumental performance.